With my boyfriend being out of town this week, I've had plenty of time to catch up on some spooky movies! All of these are available through Netflix streaming. Let me know if you've seen any of these and what you thought of them! Oh, and if none of these films are doing it for ya, iHorror has compiled a list of the best, most underrated horror films on Netflix right now! 1. Nightbreed (1990)---What a weird movie. In this tale, a young man is haunted by dreams of a place where monsters are forgiven; a place called Midian. He finds out the hard way that Midian is a real place, and he must accept his role in its very existence. Apparently this wasn't originally well-received, but over the years it gained somewhat of a cult following, and then a director's cut was released which made it a little more bearable. I liked it, though! It was unique, if not a little predictable, and one of those movies where you ultimately decide that the bad guys aren't necessarily who you think they should be. It was a nice little story, with some comedy thrown in, and I appreciate the folklore behind the short story on which its based. It's not the best film I've ever seen, but it was entertaining enough for a night in by myself. 2. Tales From the Darkside: The Movie (1990)---In order to prevent being cooked and eaten by a crazy Deborah Harry, a young boy relates three different spooky tales in this anthology series. I've seen parts of this one before, but realized I've never seen the whole movie from start to finish. You've got three tales...one of two of revenge (in a way) and one love story, all with rather creepy endings. Again, not the best thing ever, but an enjoyable way to kill some time with an array of famous actors! 3. 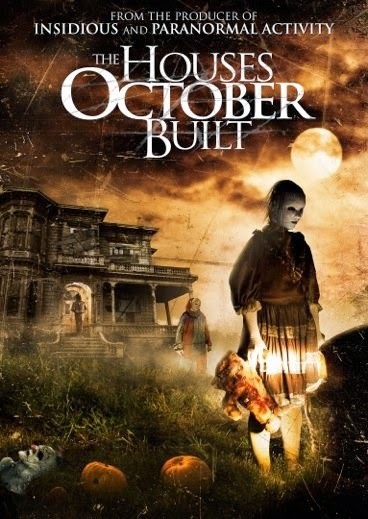 The Houses October Built (2014)---I'm not big on found footage movies, but I really did enjoy this one! Five friends rent an RV and take a road trip in search of the spookiest haunted house attraction they can find. Things get progressively weirder until they find what they're searching for...and much more. I love Halloween and everything to do with Halloween, so the concept, with its mock-documentary style was really quite interesting...and will definitely make me re-think hitting up the haunted houses this coming October, lol. The best part of the movie, however, was that it opened with a vintage commercial for the tri-state's own Camden Park's haunted house ride! 4. Black Sabbath (1964)---I absolutely adore my vintage horror, but this anthology was somewhat of a miss for me. The first story, which involved a nurse being haunted by the ghost of an elderly woman, was one of the freakiest things I've ever seen, but the second two stories were just sort of blah for me. I quickly lost interest and only half-heartedly watched while occupied with other things. It did have Boris Karloff in it, which made it all worthwhile, though. I'd definitely recommend this for the lovers of the classic horror tales. 5. The Babadook (2014)---I've heard a lot of people talking about this one for awhile now, so I decided it was time I watched it for myself. I wasn't disappointed; in fact, this was probably my favorite movie watched this week. I loved how even though the monster was pretty darn spooky, this film relied more on psychological horror than in-your-face blood and gore. The symbolism for what the monster represented is also quite interesting. As an interesting side note: At one point, the mother in the film is staying up late watching television...and the movie Black Sabbath that I also watched this week is playing!